Home » Advertising » Category archives "Advertising Spotlight"
Community news source GreaterPatchogue.com is currently offering digital advertising spots on its website. Advertising with Greater Patchogue, which has been viewed over 1 million times since its launch in July 2015, is a smart move to connect your brand to the local market. High internet traffic and direct click-throughs to your company website are just a few of the benefits of advertising on GreaterPatchogue.com. The website is now offering six new monthly ad spots which provide a community-oriented platform for business exposure to residents of Patchogue and its surrounding communities who visit the site as a primary source of local news and events. Advertising packages between start at $100 per month and range to $250 per month. The packages include 15,000+ guaranteed website impressions from users across a range of devices such as smartphones, tablets and desktop computers. For assistance in placing an advertisement or for details regarding rates and pricing, please contact The Public Relations and Marketing Group (PRMG) at 631-207-1057 or email John Zaher at info@theprmg.com. 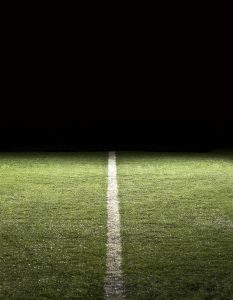 The summer season is winding down and that can only mean one thing: IT’S FOOTBALL SEASON! This September, millions of Americans will be keeping a close eye on their favorite teams and fantasy players. While friends and families gather to watch the game, companies will be trying their best to fight for the attention of key viewers. Ranked as 7 of the 10 biggest cable audiences among households (3 of 10 among viewers) led all networks on Mondays – cable or broadcast – in delivery of key male and adult demos (ages 18-34, 18-49 and 25-54). According to Sports Media Watch, in 2015, the Monday Night Football (MNF) opener brought in 14.3 million viewers, a 24% increase from the previous year. Cablevision advertising packages for the 2016 MNF season contain eighteen 30-second commercials and one-hundred 20-second promotional shout-outs. These packages start at roughly $4,000.00 for local zones and can increase to roughly $20,000.00, depending on whether you’re trying to reach viewers across all of Long Island. Multi-zone discounts are available and range from 2% to 8%, depending on the number of zones chosen. 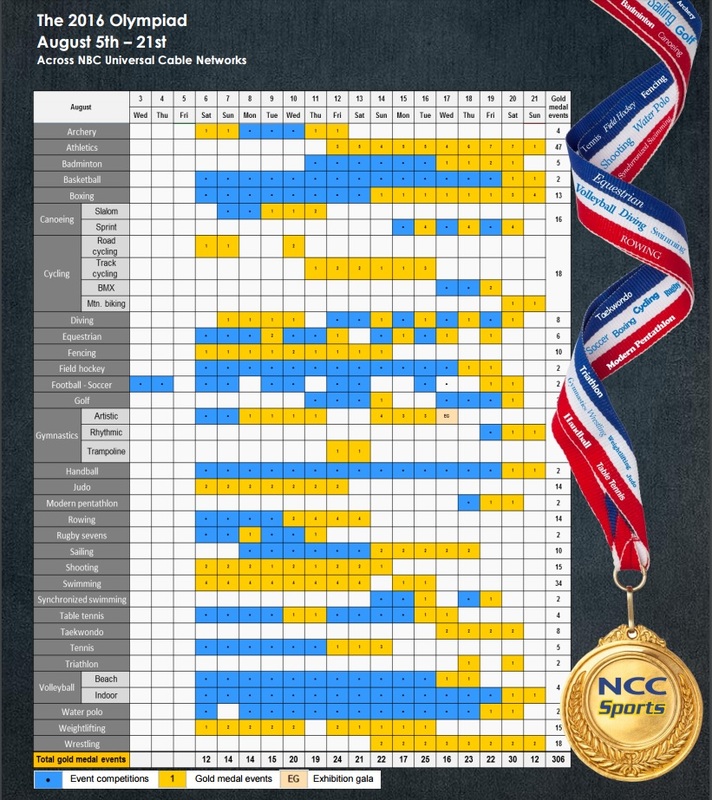 NBC’s 2016 Olympics ad packages will allow you to connect your brand to your local market across multiple NBC cable and online networks, but navigating all of the options can become cumbersome and sometimes confusing. The Public Relations and Marketing Group is well-versed in the coordination and placement of all advertising spotlights. For assistance with coordinating your 2016 Olympics advertising packages, call the PRMG today at 631-207-1057 or email us at: info@theprmg.com. *Act now for $360 per spot (island-wide) throughout the month of April! The great American pastime is once again gaining momentum as the 2016 season begins. Advertising during televised baseball games is a great way to give your business exposure to thousands of viewers. Sporting events provide an excellent opportunity to ensure that your target audience is exposed to your commercial, since few people record a sporting event to watch it later and will stay tuned during commercials, so as not to miss the action. 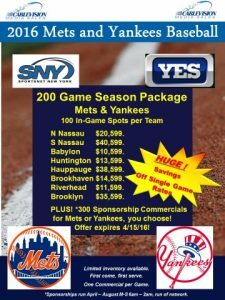 Cablevision is offering Game Season Packages that will feature your company for 100 in-game spots per team. You’ll captivate the attention of both Mets and Yankees fans across Long Island and the greater New York City area. Broadcast areas include North Nassau, South Nassau, Babylon, Huntington, Hauppauge, Brookhaven, Riverhead, and Brooklyn. 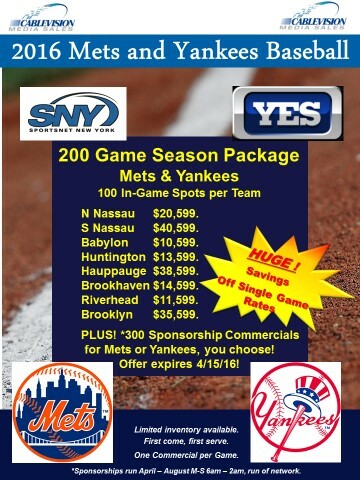 This exciting 200-game season package includes 300 sponsorship commercials for the Mets or the Yankees. Individual games are also available in each zone. If you are interested in placing an advertisement or for details regarding rates and pricing, please contact The Public Relations and Marketing Group at 1-855-PRMG-123 or email info@theprmg.com. *Must book spots by April 24th. 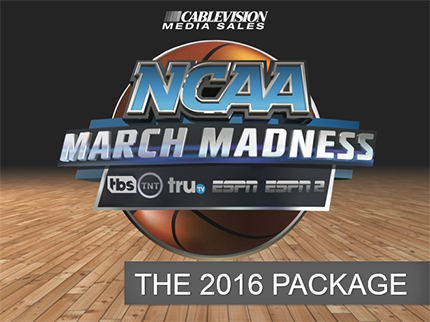 There’s no better time to advertise than during March Madness 2016. For the first time in tournament history, the game will air on basic cable, meaning your ads will be exposed to a wider audience than ever before! NCAA Basketball in March is like no other sporting event. 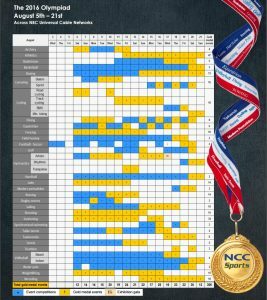 Hopeful teams compete in a dynamic month-long competition to see who is the best of the best in the NCAA. Advertising during March Madness is a great opportunity to give your business exposure to a wide audience as viewers tune in to watch some of the greatest teams in the country go head-to-head. 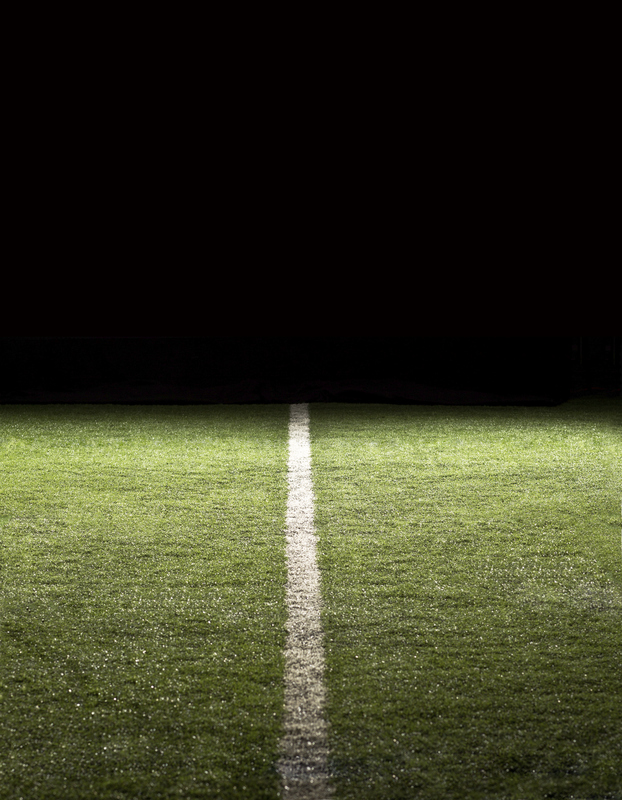 Catch the intense action from the Conference Championships all the way to the National Championship Game. Cablevision is offering 30-second spots that will feature your company during primetime and daytime showings. 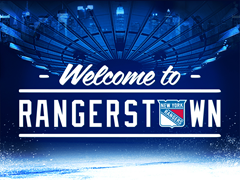 Act now to claim your in-game spot; there are only 46 total spots and they’re going quick! The First Round NCAA Tournament Games will be shown during Primetime on March 15 and 16 on TRUtv, with the Second Round Prime and Day available on March 17 and 18 on TBS, TNT, and TRUtv, and the Third Round Prime and Day available on March 19 and 20 on TBS, TNT, and TRUtv. The Regional Semifinal (Sweet Sixteen) Games’ advertising spots will be during Primetime on Thursday and Friday, March 24 and 25, on TBS. There are two spots available during the Elite Eight Games, Primetime Saturday and Sunday, March 26 and 27 on TBS, and two available during the National Semifinal (Final Four) Games, Primetime Saturday, April 2 on TBS. Act now to advertise during the 16th National Championship Game on Monday, April 4 on TBS. One hundred and eighty Client Commercial spots are available on ESPN News, ESPNU, NBCSN, and FS1, March 14 through 16 (Monday through Sunday) from 6 a.m. – 12 a.m. (midnight). This package is available in North Nassau County for $4,999, South Nassau County for $9,199, Huntington for $2,769, Babylon for $3,159, Hauppauge for $7,939, Brookhaven for $4,069, Riverhead for $3,679 and Brooklyn for $8,219. If you select more than one zone at once, you are eligible for a discount. Take a 2% discount with two zones, a 4% discount with three zones, a 6% discount with four zones, a 7% discount with five zones or an 8% discount with six, seven or eight zones.